NORCROSS, Ga., July 27, 2017 /Christian Newswire/ -- A forthcoming leadership transition at missions agency TMS Global comes at a time when it is pursuing a heightened commitment to seeing more non-whites serving in world evangelization. After more than a decade recruiting others for service with the group, the Rev. Richard Coleman is stepping down as senior director of mobilization and candidacy to prepare for a first-hand role overseas himself. 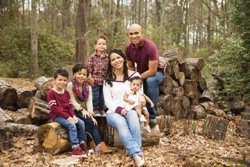 Together with his wife, Amanda, and their four children, he plans to move later this year to Ethiopia, where he will support national and regional church leaders. During his time with TMS Global, Rev. Coleman has been influential in the organization's growing commitment to seeing more African Americans like him, and other minorities, broadening the scope of the missions workforce. Believing such an emphasis is crucial in fulfilling the "Great Commission," the organization last year announced a new commitment to diversity, better reflecting the rich breadth of God's church and kingdom. "It makes our message more authentic," said Coleman, who leaves his position at TMS Global's Norcross, Ga., headquarters in July to join the organization's almost 200-strong team of workers serving in a wide range of ministries. "There are certain parts of the world where people have said, 'We will not believe this message until we hear it from the mouths of other people of color,'" he said. "Having that same message of hope and truth coming from another person of color can be reassuring and even add credibility to our witness." Coleman has been committed to missions since 1998, when he went on his first short-term trip to Uganda while a student at Oral Roberts University. Upon graduation he served as the director of missions at an Atlanta megachurch before joining TMS Global in 2006, initially as manager of recruitment. In addition to helping scores of people find their place in God's global mission, both with TMS Global and other organizations, Coleman has taught the "Perspectives on the World Christian Movement" course and led short-term missions teams to various places around the globe, including Africa and Central America. Additionally, he has also been involved in global leadership in the missions community, serving on the planning team as the global selection chair for the 2016 Lausanne Younger Leaders Gathering. Coleman's commitment to seeing more believers of color serving in missions was significant in TMS Global's own diversity push. That initiative has included the 2016 appointment of the Rev. Romal Tune as full-time senior adviser to TMS Global president and CEO the Rev. Max Wilkins, and the founding earlier this year of an African American Mobilization Advisory Board comprising influential leaders representing a broad range of African American churches. Ordained by the Evangelical Church Alliance International in 2014,Coleman has been encouraged to see others embrace the work of diversifying the North American sending force. Knowing that others are stepping up helped him to step out into his own desire to serve abroad. "Knowing that African Americans made up less than 0.6 percent of the full-time sending force from America, I felt like maybe my calling was to stay behind and help change that reality," he said. "But over the years I began to feel I was fulfilling a role that others could now fulfill." "We're grateful for the way Richard has championed the need for greater diversity in missions, and having pointed the way for others, is now showing the way personally," he said. "We hope we can help many others follow his example, so that as a global church we more fully embody and reflect the truth of the message we proclaim -- that the good news of Jesus is for everyone, everywhere." TMS Global (www.tms-global.org) mobilizes and equips the body of Christ to share the good news of the gospel, with an emphasis on the least-reached peoples of the world. Workers are engaged in a wide range of dynamic, culturally-sensitive ministries, from training and leadership development to literacy, medical care and relief aid. To schedule an interview with a representative of TMS Global, contact Ty Mays at (770) 256-8710 or tmays@inchristcommunications.com.